A common way to read the aces from the minor arcana is to think of them of the essence of suite. If the Cups are romance & relationships, intuition and water, then coins are almost the opposite. Coins are as real-world, physical-realm and practical as the cups are intuitive and esoteric. If I were to pick a t-shirt for the card, I’d probably choose one of those old Nike shirts with their old slogan “Just Do It”. Most of the time, Tarot cards pull us from the physical to the spiritual, mental, abstract and esoteric. Most of the time that’s what we need…we spend most of our time and energy in the “meatspace” of daily life, doing what we need to do to survive. So that is one aspect of the coins…dealing with the common, deep-seated issues about meeting needs. Even if one person’s definition of true need and hardship is different from another’s – that’s not for us to judge. Fear and worry are real to the individual, however they compare to other people’s. So we need to ‘just do it’ on a physical level when we see this card. 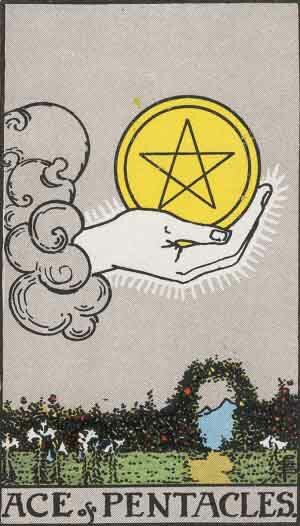 The Ace carries many reassurances in the classic meanings: greatness, health, abundant resources and more. But underneath that is a reminder we need to ‘just do’ our part. A shift in perception from craving the things we don’t have to being grateful for the things we do have makes richness appear as suddenly as a winning lottery ticket can – only better. The mental/spiritual work involved here is looking for existing good things and finding thankfulness for them. The physical level work is just exactly that – physical level. If we are purely creatures of the physical realm, we lose a precious part of being human. The same is true if we live purely spirit-minded. We can’t go through life all head-in-the-clouds, woo-woo, disconnected. That kind of thinking is unrealistic and disconnects from the comfort and strength of the HERE and NOW just as surely as worry, fear, and anxiety can. The ace of coins is a reminder to do what needs done. Sometimes the thing that needs doing is a mental shift from craving to gratitude. Sometimes the thing that needs done is a shift from the mental to the real world. Sometimes to achieve the greatness the Ace of Coins promises we have to let go of spiritual-izing and intellectualizing everything and be mindful of the physical realm. Here too, we see the wisdom of the old Zen proverb “before enlightenment, chop wood and carry water. After enlightenment, chop wood and carry water.” Let go of the woo woo and live the enlightenment, here and now. Just do it.